It’s amazing what you can teach a dog to do when you have a handful of tasty treats. Even the smallest tidbit is alluring enough to get your dog interested in following along. Depending on the dog, and the trick, some commands will be more difficult to teach than others, but this is a listing of my top 10 simple tricks to teach your dog. But, before we get started……. Treats: Since teaching tricks requires you to repetitively treat your dog to encourage his participation, be sure to keep the treats small! Otherwise, you may end up with a tricky dog, but a roly-poly one at that! Praise: Don’t only reward your dog with treats, be sure to be vocal in praising your dog too. He needs to hear your voice of approval. Time Frame: To work well in conjunction with your dog’s attention span, you should only work on tricks in short spurts. Working too long will be ineffective as your dog will lose interest. Practice: Practice makes perfect, so practice daily. And once the trick is learned, don’t forget to continue it into the future to ensure it’s not forgotten! Learning Speed: There’s no specific timetable to indicate how long or short of a time it will take your dog to learn a new trick. Like people, they all learn at different speeds. So don’t be discouraged if it takes your dog awhile to catch on. Be calm and assertive; never yell or show frustration. With practice, patience, and consistency success will ensue! Atmosphere: Always train your dog in a quiet area, free from distractions. However, once you feel the trick has been mastered, don’t be too sure! Dogs get distracted easily, so practice in busier environments to ensure your dog is always able to perform it perfectly. Only then can you claim a full-proof performance! Without Further Ado….The Top 10 Simple Tricks To Teach Your Dog! High Five: Be sure your dog knows the command to sit before trying this trick. Give your dog the command to sit. Gently take his paw with one hand and hold it up pressing it to your other hand as in the high-five position while giving the command, “high-five!”. Then praise and treat your dog. Keep repeating this until he learns to raise his paw on his own. Wave Goodbye: The technique to learning this trick is similar to the high-five, except you will give the command, “wave goodbye!”, and refrain from touching his paw when he raises it. following the same steps as above, have your dog sit. Gently take your dog’s paw with one hand and hold it up, but this time do not touch your other hand to his paw. Be sure to give the command, “wave goodbye!” as you are raising his paw. Praise and treat your dog. It’s a great party trick to have your dog wave goodbye to all your guests. Play Dead: Be sure your dog knows the command to lay down before trying this trick. Give your dog the command to lay down. Gently roll him on his side, and if he complies, give the command “play dead!”. Be sure his head stays on the floor. If you have trouble getting him to roll on his side, you can also use a treat to help. To do this, have him lay down, then hold a treat near his nose, making sure he can’t get at it, and slowly move the treat towards his rear, then up and over his body watching to be sure his nose follows along as he falls into a natural roll. Some dogs don’t care for rolling over so this one may take more time to learn than other tricks. Try to get him to lie still for a few moments, only standing up again when you command him to. At that point praise and treat him. Spin: Make sure your dog is standing facing you, and that he is calm, and paying attention. Hold a treat in front of his nose and wind it slowly around in a circle. The idea is to have your dog follow the treat with his nose, therefore, spinning in a perfect circle while doing so. Be sure to give the command, “spin!” once he starts circling, and keep the treat held low so he doesn’t jump up for it. Praise and treat him once the circle is complete. Eventually, you’ll just have to speak the command, although you can also clue him in with a slight circle motion of your arm, just not as exaggerated as when you taught the trick in the first place. Army Crawl: Be sure your dog knows the command to lay down before trying this trick. Have your dog lay down, then hold a treat in your hand with it slightly protruding between your fingers so that your dog can smell it, and lick it, but not grab it. Slowly slide your hand across the floor away from your dog’s nose, and he should scramble (or, army crawl) toward it. When he does, be sure to give the command, “army crawl!”, and praise and treat him. Be sure never to praise and treat if he stands up. If this happens, start the trick over again from the beginning. Eventually, you’ll be able to give the command without the treat teaser, and he’ll know just what to do. Take a Bow: Make sure your dog is standing. Hold a treat near his nose and slowly move it downward to the floor. The idea is to have his nose follow the treat whereby he will lean down with his elbows on the floor, but his rear end will stay in the air. To prevent him from laying down, you may need to place your arm under his tummy as his nose is going down for the treat. He should learn to remain in a bow for a few seconds, at which point you should then bring the treat back up and offer it to him, but only once he is back in the standing position. Don’t forget to praise him vocally too! 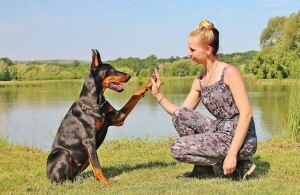 Teaching this trick can also work by you saying the command “take a bow” whenever you see your dog in that position naturally, such as during play, or when stretching. Although you would need to keep treats on hand to be offered simultaneously. Back Up/Scoot Back: This trick is good for when your dog gets in the way and you need him to back up! Starting in a narrow area, such as a hallway, works great. Have your dog face you, then give the command of, “back up!”, and walk toward your dog forcing him to back up. Every time he does, praise and treat him. Practice this each day until your dog eventually learns to back up without you stepping toward him. Stay: Be sure your dog knows the command to sit before trying this trick. Have your dog sit in front of you. Put the palm of your hand in front of his nose and give a firm command of, “stay!”. Take a few steps backward, and if he stays be sure to praise him and give him a treat. If he does not stay, then walk back over to him, calmly sit him down, and begin the process all over again. Practice this every day, always increasing the length of time for his “stay”, as well as the distance between the two of you. Use a command such as, “ok”, to release his “stay” position. Come: This trick will be easier if your dog first knows the “sit” and “stay” commands. Have your dog sit, and stay, across from you, with a leash on. Next, firmly give the command of, “come!” while gently giving a tug on his leash toward you. If he stops, or goes in another direction, give an additional gentle tug. Praise him verbally as soon as he starts moving toward you and offer the treat once he reaches you. Once he gets good at this, make his leash longer to increase his distance from you. Repeat each day, increasing the leash length, and eventually removing it altogether. Go to Your Place: This trick is nice for many reasons, but some common ones are when you want your dog to go to bed for the night, you don’t want him begging at the dinner table, or you don’t want him pestering your guests for pats and belly rubs. Have your dog follow you to a spot nearby to his bed, or mat, and let him smell a treat in your hand, but don’t give it to him. Let him see you toss the treat onto his bed while giving the command, “go to your place!”. It won’t be too difficult to arrive at the desired outcome, which is for him to go to his bed and eat the treat. Praise him when he does. Call him away from his bed, and repeat this step again. Continue this step over and over until you can eventually give the command and your dog will go without the treat. At this point, you can walk over to your dog’s bed and hand him the treat instead of tossing it. This will encourage him to follow the command since he knows that the treat will be coming his way. Be sure to praise him when he follows through. Hand motions work well too, so a pointing motion toward his bed as you give the command will help. Next, you will want to work on him going to his bed on command, and laying down on command (only praise and treat him after he lays down). You can continue to progress on this trick by working on getting him to go to his bed, lay down, and stay, each time staying for a longer length of time. If you practice this consistently you’ll find that your dog gets quite good at it! What a lovely article Carol! By chance do you know if I can use the same tricks on my cat? I always wanted to train my cat and didn’t know how. Great article, thank you for your info! I can’t claim to be an expert in the cat arena, but I do know they are more difficult to train than a dog. Even so, I’m betting at least a few of the same techniques would apply. It’s worth a shot! These are great. I’ve been looking for some basic tricks to work with my dog on, just for fun and bonding. I’ll have to try these. Oh great, glad you’re going to give them a try! I’ve always thought it was so much fun teaching my dogs new tricks, and dogs love learning them. Have fun!